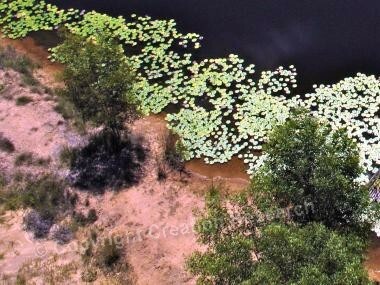 In the mid 1990s Creation Research was asked by a rural landowner near Gympie, Australia, to identify what he thought was petrified wood discovered when excavating a new dam. Fossil wood it was, and so began a series of field trips that eventually led to Creation Research excavating a fossil log jam. The fossils were logs, mostly Southern pine (Araucaria) trees. 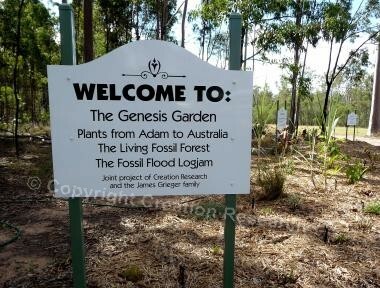 Araucaria trees still grow in Australia, so we decided to plant living specimens nearby and use both fossil and living plants to illustrate the history of the world recorded in Genesis. 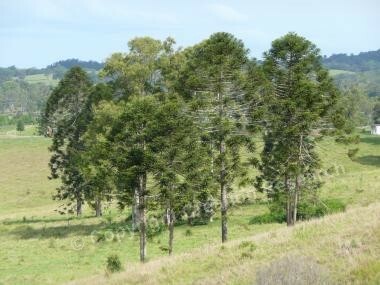 We started by planting a grove of Araucarias, including Hoop, Kauri, Bunya and Wollemi pines near the fossil logs. Along with battling drought and marauding goats, portraying the plant history of the world has taken much creative design, endurance and hard work. Genesis tells us God created plants as fully formed functioning plants according to their kinds (Gen 1:11), and also tells us the world had a good created beginning, but has gone from good to bad to worse. The world is not evolving upwards from simple to complex, but devolving downwards. Our Jurassic Ark site with gardens, fossils and murals sets out this story. 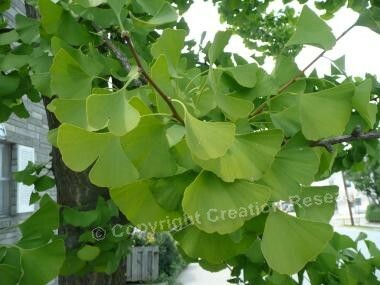 The first plant labelled as a living fossil was the ginkgo. This tree was first been brought to Britain in the mid 1600s and during the 1800s was planted in the parks and streets of London. The ginkgo was labelled a living fossil by Charles Darwin when he "created" this term to describe living things that have not changed since their ancestors were first fossilised. 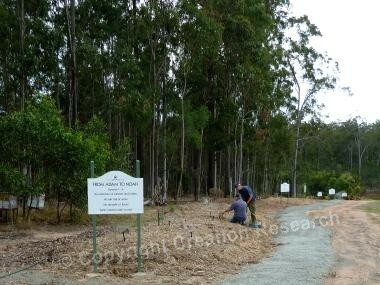 We have planted ginkgos in our Living Fossil Forest. 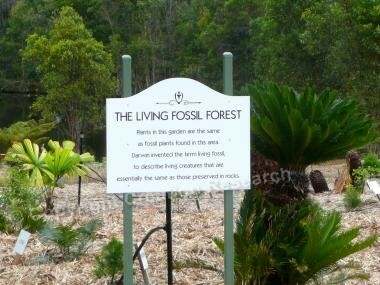 There are many examples of living fossil plants, including ferns, palms, ginkgos and cycads, found in Jurassic strata around Gympie and elsewhere, so we have added these to our living fossil forest. Cycads have long been classified as living fossils, so when a local plant nursery offered to donate several truckloads of large cycad plants (provided we collected them) we gratefully accepted. 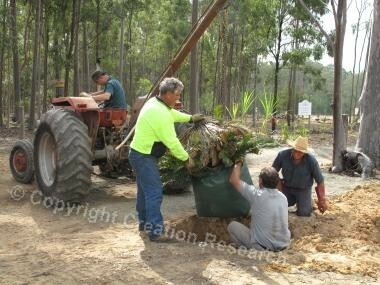 Shifting mature cycad plants is no easy task. It required large trucks and lifting machinery. Planting them is even more hazardous. 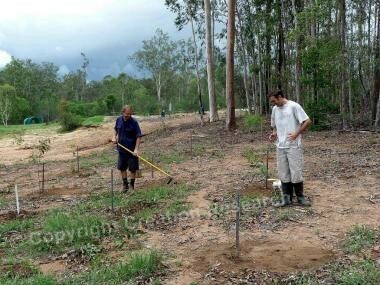 However, with extra human and mechanical help we were able plant even the largest specimens. 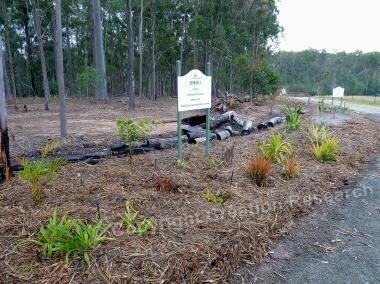 Thanks to good rains in the 2010 Australian Spring the cycads soon sprouted new fronds and cones. 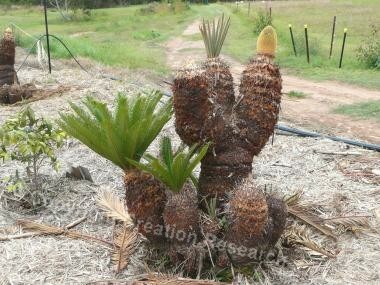 Cones are the way the cycads reproduce. 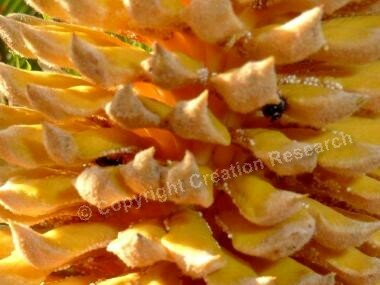 Male cones produce pollen and female cones contain ovules that receive the pollen and set seed. Cycads are pollinated by insects, including beetles, thrips and weevils. As such, they differ from pine cones, which are pollinated by wind. According to evolutionary theory the relationship between pollinating insects and plants was supposed to have evolved when flowering plants evolved after pine trees. 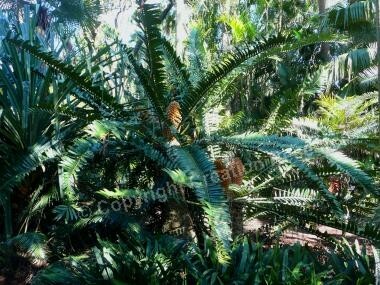 However, cycads are supposed to have evolved before pine trees, so the evolutionary story will have to be revised. The facts, however, fit the Genesis account of living things being created in fully functional states. 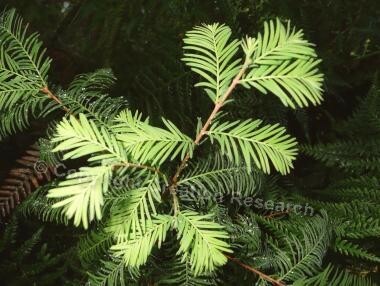 The Wollemi pine is the most famous Jurassic Southern pine in our garden as it was believed to be extinct for almost 200 million years but found to be still alive near Sydney, Australia in 1994. As it has not changed from when it was first fossilised until now, it has not evolved. It has reproduced after its kind. After we started on the Living Fossil Forest, we realised we could also use a series of gardens and trees to illustrate the Biblical history of the environment, from creation to the present. 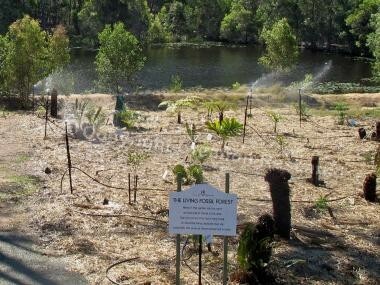 In 2008 the display was extended, with some 300m of garden display added to show the history of the world from Adam to Australia. Man's first home was a garden planted by God and described in Genesis 2:9 as being pleasing to the eye and good for food, i.e. it was beautiful and functional. God's created plants were all good. There were no weeds, thorns or dangerous plants. Our Eden garden is designed to reflect this. As well as gardens we have a mural series illustrating Biblical history. The first one illustrates Adam and Eve in the Garden. 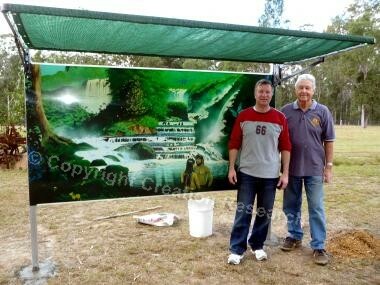 Standing next to the mural are artist Steve Cardno who designed it, and retired builder Fred Dainty who erected the frame. 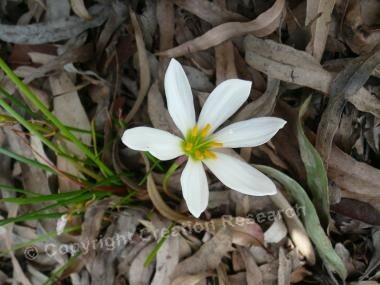 To make our gardens beautiful we put in many kinds of flowering plants, and our first flower bloomed in March 2010. Flowers are the means by which many plants reproduce, including the ones grown for food and fibre. When food and fibre plants reproduce we can depend on them producing their own kinds. Farmers and gardeners have depended on this predictability for theirs (and our) livelihoods and still do. Orchids are some of the most beautiful and fascinating flowers God made, so we have planted many in and around our Genesis 1 garden. 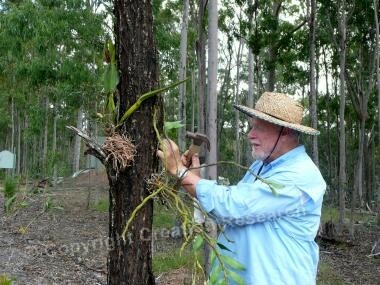 Planting orchids down under in sunny Queensland means simply placing them in old tree stumps and hollow logs or in the forks of trees. Sometimes they can just be nailed to the tree, as Creation Research Director John Mackay is doing. 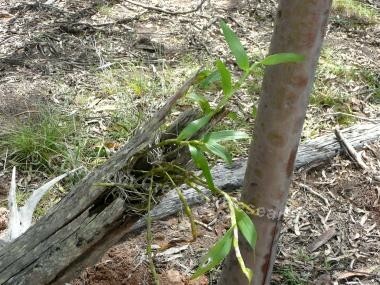 This does not harm the orchid and its roots will soon grip the tree trunk, and it will happily grow on the side of the tree. 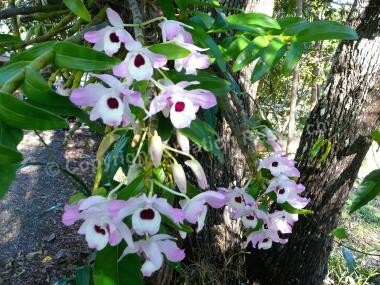 Orchids are not parasites, but epiphytes. They use other plants for structural support, but do not feed off them. Genesis 2: 5-6 tells us that in the beginning the earth was watered by a rising mist, which is still the best way to water plants, rather than hosing, or drip or flood irrigation. Mist gives them plenty of moisture, without damaging their leaves, flowers or fruit. These days the only way we can get anything like a rising mist is to install an expensive sprinkler system in our Jurassic Ark gardens. 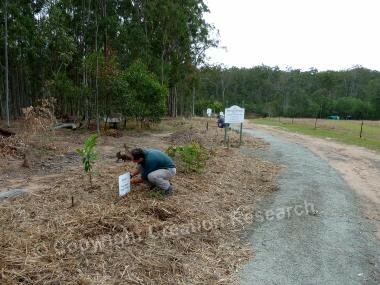 Our sandy gum tree forest soil is very low in organic matter, so we have added enormous quantities of mulch to enrich the soil. Good soil not only needs the right chemicals, but also must be alive with fungi, bacteria and worms. 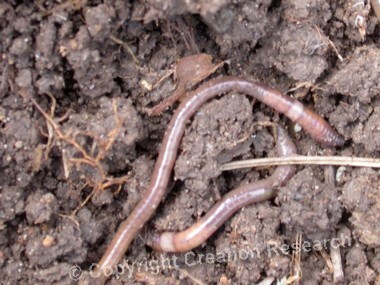 Worms literally eat their way through the soil, physically turning it over and adding nutrients, so adding bucketloads of worms have been part of our strategy to provide the best environment for plants to grow. These interdependent relationships between living organisms are further evidence that the living world was created quickly, in a fully functioning state. Genesis 3:5 tells us the world is no longer in its original perfect condition because the first humans rebelled, or sinned, against their Creator and sadly all human beings have inherited this sinful nature. As part of His judgement on man's sin, God cursed the ground and said it would in future produce weeds, thorns and thistles, so we have planted a garden of weeds and tough thorny plants. We must be the only gardeners who actually want some of these unpleasant plants to grow. 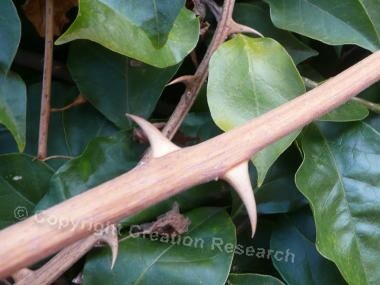 Thorns and spines actually result from the degeneration of plants and occur when branches or leaf bases fail to form, or fall off. Since many plants have both thorny or spiny forms and smooth forms we have planted all variations in our Genesis 3 Garden to show that even though some plants have changed in a degenerate way since God cursed the ground, they are still reproducing after their kind. 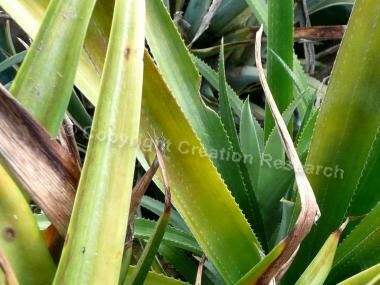 The thorny/spiny varieties are not evolution, but a degeneration of the plant. This cataclysmic event tore up trees, smashed and buried them in masses of sediment. 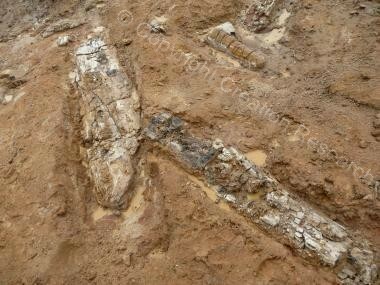 The fossil logs at our site show all the evidence of such violent upheaval and burial. Noah's flood would have been the first, and major, source of destruction of life and the environment in the history of the planet. 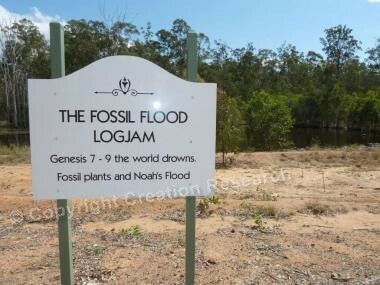 Genesis 9 informs us the climate dramatically changed after the flood. Winter and summer arrived and natural selection became a real force. No longer was the planet uniformly warm and moist, but some regions, like Australia, began drying out significantly over the next few thousand years. 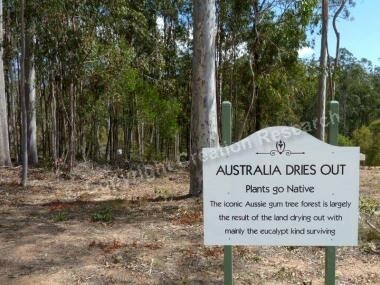 The most distinctive Australian vegetation is the eucalyptus or gum tree forest. 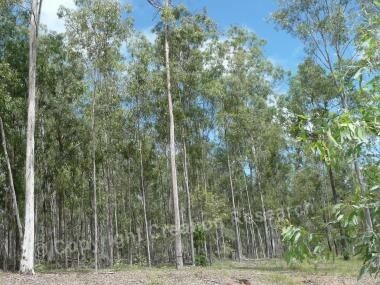 These trees now dominate the Australian landscape because they out-compete other trees in the harsh Australian conditions. Australia is not the only place they grow, but in more moist places, such as Indonesia and Papua New Guinea, other trees can compete with them and they are not so dominant. This is a real example of natural selection, otherwise known as survival of the fittest, but it is not evolution. Natural selection only eliminates the unfit. It cannot produce new living things. Creation Research conducts supervised Field Trips to the Jurassic Ark site, where visitors can see and learn from the living and fossilised evidence. 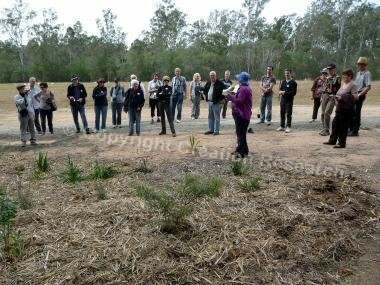 Here, Diane Eager talks about the Genesis 3 garden with a group who were on our first Aussie Outback Tour in 2010. We have come a long way since we found the first fossil logs, but the site is still a work in progress. More murals are being designed and more plants will be added to the gardens. We have also started to test the effects of increasing carbon dioxide on plant growth. A site like this needs are good deal of infrastructure (watering systems, drainage, paths etc.) as well as continued maintenance.